Give credit where credit is due — University of Colorado Public Health professor Lisa McKenzie must be moonlighting as a public relations professor/professional given that she sure knows how to work the earned media front, releasing reports that achieve one scary, fear-mongering headline after the other. In fact, we’ve seen this several times over the past few years, the most recent example earlier this month as McKenzie released her latest report. 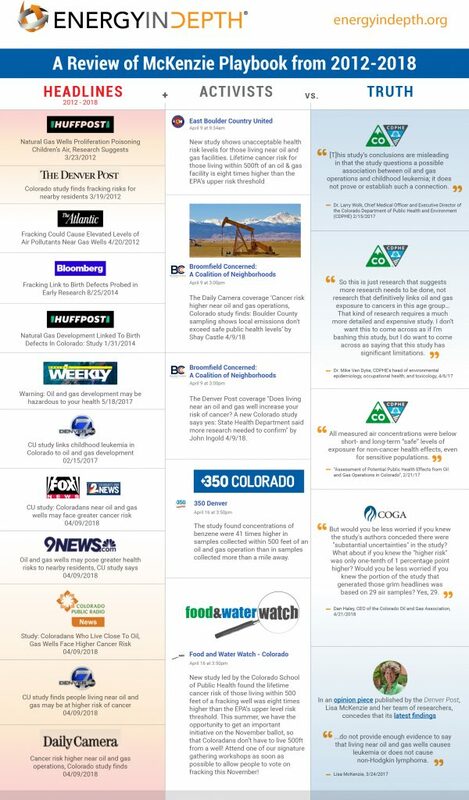 Like clockwork, this report successfully made a media splash in Denver and carried out a full-court press across the country with over-exaggerated and unsubstantiated headlines about oil and gas activity. Alarmist sounding headlines in the media generated by inflammatory press releases promoting the study. Followed with push back by state regulators showing limitations of the study, and maybe an industry comment at the end. The report or media coverage may even have a mention by McKenzie admitting the limitation of her study and a call for additional money for more studies. The headlines are then used by anti-fracking activists to scare the public without any mention of the limitations of the study. In fact, as covered by EID-Mountain States’ Heath Report released in April, many of McKenzie’s actual findings stand in contrast to the general media narrative they generate. EID examined health data from Colorado’s top oil and natural gas producing region, Weld County, and also took a deep dive into the Colorado Department of Public Health and Environment’s (CDPHE) analysis of several studies that purported to show a correlation between oil and gas activity and ill health effects. CDPHE’s findings directly refute claims that oil and gas development is a high-risk threat to public health. Instead, it found shortcomings in most of the reports, including those authored by McKenzie, and deemed many inconclusive. A new report released by EID earlier this year examines public health data points and highlights analysis conducted by the CDPHE, which show positive health indicator trends and low-risk air sample readings that stand in stark contrast to claims made by activists opposed to the state’s oil and gas industry. Despite CDPHE findings, anti-fracking researchers continue to produce work in an effort to stand counter to the state’s top health regulator’s findings. “To be clear, our industry is very supportive of research and science. Colorado’s oil and natural gas companies are working each day, using science and scientists, engineers and geologists, to find new and innovative ways to use 21st century technology to reduce emissions, decrease our footprint and make our industry cleaner and safer than anywhere in the country. EID reviewed McKenzie’s past reports roll-outs, spanning the past six years. We see a consistent trend of scary media headlines and subsequent pushback by the state’s top health regulators. The Colorado Department of Health and Environment’s (CDPHE) Chief Medical Officer and Executive Director, Dr. Larry Wolk, issued a statement which confirmed the many flaws EID discovered in McKenzie’s most recent study. Contrary to the study’s alarmist topline conclusion, Dr. Wolk, responded with, “This study confirms our 2017 findings of low risk for cancer and non-cancer health effects at distances 500 feet and greater,” referring to the 2017 CDPHE Report: Assessment of Potential Public Health Effects from Oil and Gas Operations in Colorado, which found, based on 10,000 air samples, a“low risk for cancer and non-cancer health effects at distances 500 feet and greater.” And despite the headline, just 29 of the 660 samples used in McKenzie’s study were from 500 feet or closer. Click here to read EID’s full debunk. In 2017, McKenzie published a study claiming to find an association between oil and gas development and childhood cancer that was immediately disavowed by the CDPHE for a myriad of reasons, including its small sample size, failure to measure individual exposure and failure to address additional or alternate risk factors. McKenzie and her research team ignored a host of other risk factors, including smoking during pregnancy, access to pre-natal care and genetic history. This study was so flawed that CDPHE issued a statement prior to the papers’ release warning the public not to be misled by its conclusions. Dr. Wolk said the researchers used “miniscule” statistical differences to claim some kind of connection, a connection which public health officials rejected. “[W]e disagree with many of the specific associations … [and] a reader of the study could easily be misled to become overly concerned,” Dr. Wolk said in a January 2014 statement. The study that kicked off a series of many other disavowed studies to follow claimed to show “air pollution caused by fracking may lead to health problems for those who live near natural gas drilling sites.” The report was so seriously flawed that the research team responsible for the paper was fired by the Colorado county that commissioned it almost a year before the study was published. Garfield County environmental health chief Jim Rada also disavowed the paper for its “significant” data limitations. Though the study’s conclusions were based on actual air samples (a rarity among such literature), it exaggerated emissions from well development by at least 10 times, due largely to the fact that the researchers failed to take into account exhaust fumes from a major interstate highway less than a mile away. The study’s long list of flaws also includes the fact that it included no background emissions data and also failed to note the cancer risk detected was not above the national average. The researchers’ methodology was so bad that the CDPHE reneged on its planned funding of the research. CDPHE has been a vocal critic of McKenzie’s work ever since.